You have set up your landing page. It looks fantastic. You may have heard stats on changing button color, number of fields and image positioning. The message is clear: One small tweak can have a big impact on performance. Introducing conversion rate optimization, a fail-safe method to boosting conversions on your landing pages. 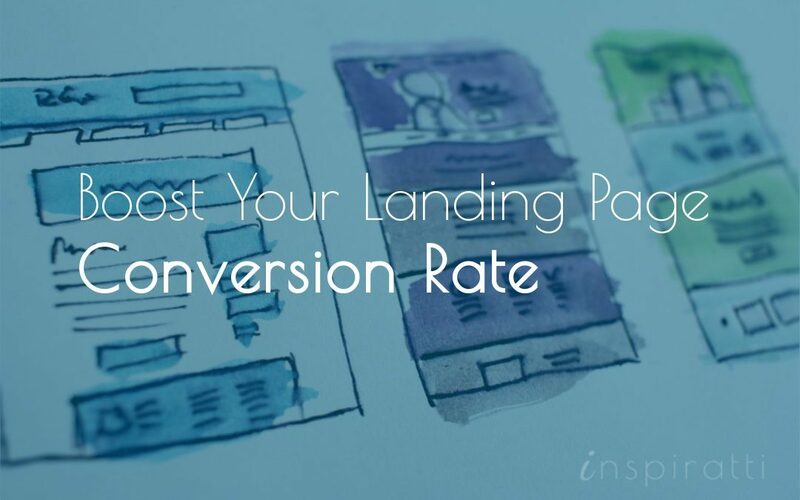 In this article, I’ll walk you through a step-by-step process you can use to boost the conversion rate of your landing pages. Let’s start with the first step. Appreciate basic stats. Use Google Analytics to find basic stats such as time on page and bounce rate. You can even track the percentage of visitors who achieve a specified goal on your landing page. For that, you need to set up goals in Google Analytics. The opportunities for goal creation are limitless. This can be overwhelming so let’s take a moment to consider the most useful goals for landing pages. You could set up an event goal to track every time someone clicks on a specific button, or a destination goal when people reach a thank you page (Shopify). Read this article for details on the different types of goals and how to set them up. 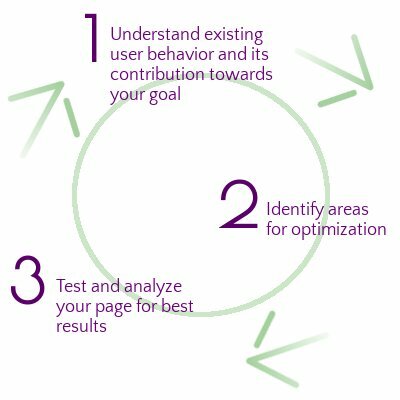 Understand user behavior on the landing page. You need to do some kind of on-page analysis to understand what is working and what isn’t. Assessing how people interact with your page helps sort the effective from the ineffective elements. Mouse tracking analysis will let you see which areas of the page get most engagement. You could also conduct user testing. Assign a specific task for a user to complete on your page and watch them complete it (impact). This can help you uncover what may be stopping prospects moving forward, which you can confirm in testing. In the previous step, we spent a lot of time trying to understand your audience. In this step, we’ll explore how we can make use of these insights to inform how we approach optimization on your landing pages. Know essential elements of an effective landing page. 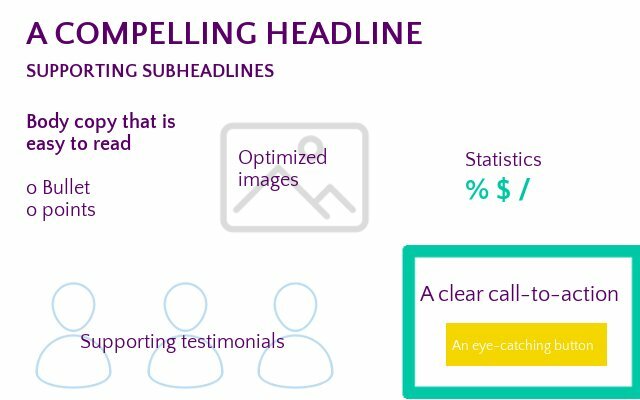 An attention-grabbing headline, relevant images, and clear call to actions are vital components of an effective landing page. The image below highlights the key components of an effective landing page, but there is much more besides. Let’s explore some of the crucial aspects you need to consider. I have divided them into page layout, messaging and design. Creating a landing page is complex because it depends upon so many factors, including the offer, the audience and the brand. But going through the questions above will help you pinpoint problem areas that could be contributing to poor performance. This leads me to the next point. Implement your test in line with your hypothesis. 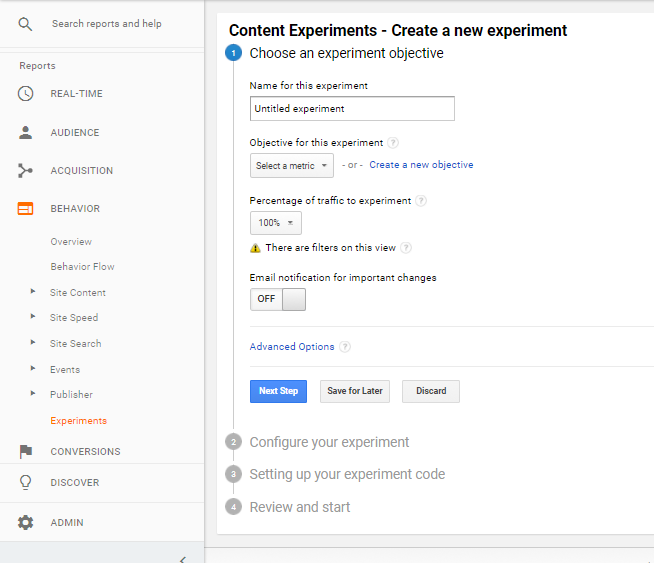 You can easily set up content experiments in Google Analytics. Navigate to the experiments section in the behavior tab. You can then enter all the details to set up your experiment. Brian Dean provides straightforward guidance to setting up your experiment in this video. I’ve summarized the key steps below. You need to fill out this form to set up your content experiment in Google Analytics. Once you have optimized one element, you can experiment with other elements. This could include messaging, design, images, page layout and more. Remember, keep things simple. Change just one single important element at a time such as a headline or call to action text. That way you can easily measure effect on performance. If you change many elements at once, it is difficult to work out what is affecting the results. Choose the next element you want to test, go back to step 1 and repeat the process. Landing page optimization is a continual process of understanding and testing to get better results. How do the top 5% of companies achieve a conversion rate x5 higher than the average (Wordstream)? Answer: They understand their target audience extremely well. And they are constantly finding out more about them with continual testing. The insights they gain from one page can be applied to different pages and even other areas of their marketing. Creating the perfect landing page is a process. After publishing, you need to continue to test, learn and optimize. Awesome post! I like to emphasize even more on having a clear CTA. Many times you find a great landing page, but the reader is not really sure what to do next. I always advise my network of bloggers to use a call to action that tells the reader exactly what they need to do next. There is no reason to optimize a page for new subscribers if there is no clear “Click here to subscribe and join us” and that is the minimum required. Thank you for this awesome read! Great point Stefan. A clear call to action is certainly one of the most important features of an effective landing page. It is frustrating to see many people not using them well.